Select Menus → Menu Manager from the drop-down menus. Edit. Opens the editing screen for the selected menu. If more than one menu is selected (where applicable), only the first menu will be opened. The editing screen can also be opened by clicking on the Title or Name of the menu. Delete. Deletes the selected menus. Works with one or multiple menus selected. Deleting a menu also deletes all the menu items it contains and any associated menu modules. On clicking Delete you will be asked to confirm that you want to delete the selected menus. Clicking OK button will delete the menus. Click Cancel to abort the deletion. Options. 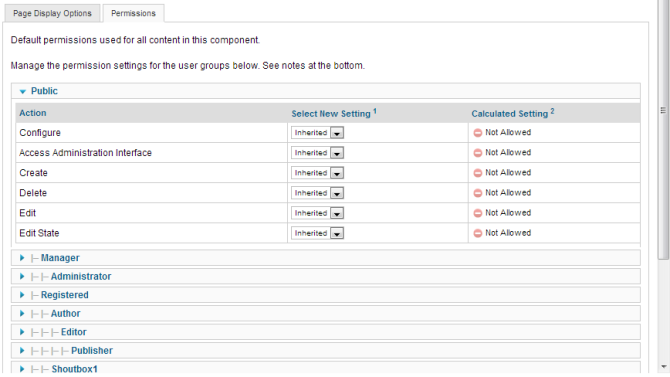 Opens the Options window where settings such as default parameters or permissions can be edited. See Menus Configuration. This page was last modified on 17 July 2013, at 10:19.